A view of the workshop on the inaugural day at Sabitri Bharali High School premises in Udalbakra, Guwahati. As the people of Deori community in Assam, Arunachal Pradesh and other parts are gearing up to celebrate Bohag Bishu, one of the most important festivals of the community, the Guwahati Deori Jatiya Mancha, an apex socio-cultural group of the community, headquartered in Sonaighuli in the city, for the first time has organized a four-day-long workshop on ‘Deori songs and Deori Dance’ in the city. As previous years, the Guwahati Deori Jatiya Mancha is also getting ready to organize Deori Bohag Bishu on Wednesday next at the permanent stage of the Deori Jatiya Mancha at Sonaighuli in greater Kahilipara of Guwahati with a day-long colourful programme in a traditional manner. Keeping in view of the upcoming Deori Bohag Bishu to be organized on April 18, 2018, the workshop will continue up to April 17, 2018. The inaugural ceremony of the workshop was held at the Sabitri Bharali High School premises at Udalbakra in Kahilipra in the city. The workshop was inaugurated by the President of the Mancha, Pradip Deori on April 14, 2018. 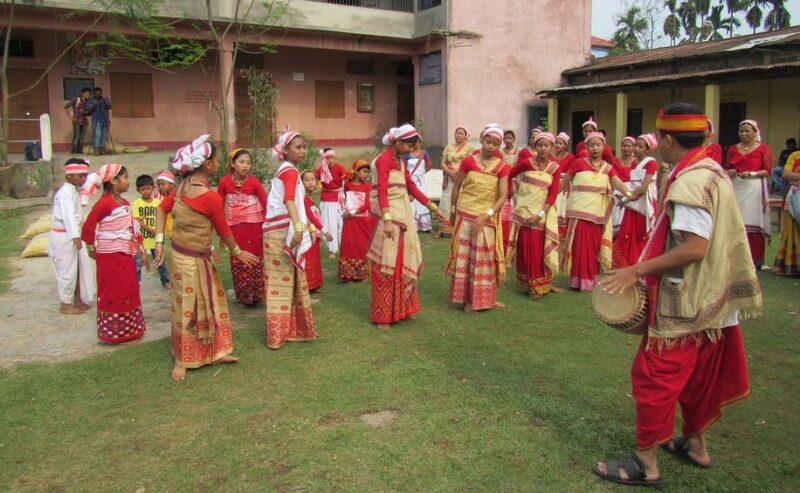 “The main aim of organizing the workshop is to get the new generations introduced with the age-old culture and traditions of the Deoris as an attempt to preserve the culture of the community and keep it alive,” Bharat Deori, Advisor of Guwahati Jatiya Deori Jatiya Mancha, told this correspondent. The participants of the workshop are being trained by Jyoti Deori, Guneswar Deori, Ramdhan Deori and Jatin Deori. Besides, during the workshop, the participants are also being trained by experienced pepa and dhol experts, who have come from different parts of the State. The organizers have expressed satisfaction at the participation of a number of boys and girls from different parts of Guwahati in the workshop on ‘Deori songs and Deori Dance’.